Remember when you were a kid, dragging your feet to the grocery store with mom, already ‘bummed out’ because you knew she wasn’t going to let you get your favorite sugary breakfast cereal, Smurf Berry Crunch. Cruel, right? But your mopey seven-year-old spirit lifted when you approached those giant automatic sliding doors and spread your arms like a wizard, timed precisely the same moment those glass panes opened. You did it. And it was magic. What would you say if I told you this epic feeling of ‘genie in the lamp meets telekinesis’ could be a daily occurrence? The field of electronic security is growing fast and smart locks are a leading factor in that development. A smart lock is just what the name implies. It has the same components as the lock in your front door right now; a lock mechanism and a key. A smart lock is comprised of the same except the two parts are electromechanical. Instead of a brass piece expertly cut, a smart lock key can be a smartphone app, fob, ekey, virtual key, or even a biometric element (which is just a fancy way to say fingerprint, palm vein reader or iris scan to name a few). 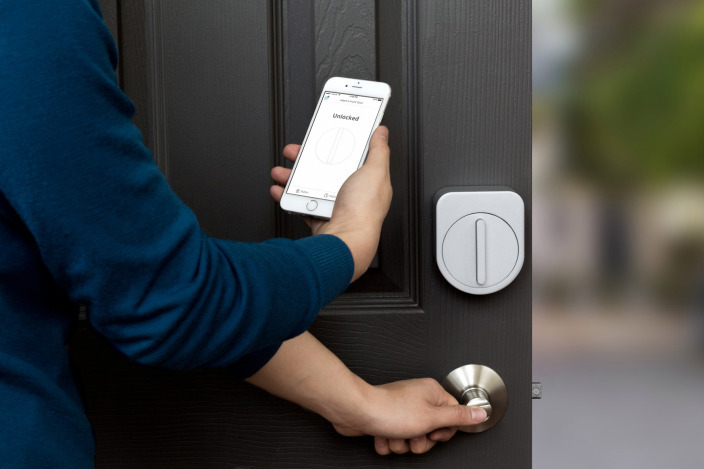 Smart locks are sleek, high-tech, and full of functionality you didn’t know you needed. But it’s the flexibility, connectivity, and access monitoring that increases your safety and security. Smart locks operate over wireless communication channels that drive the functionality. The more widely used methods include Bluetooth, Z-Wave, and Zigbee. • Designed for low-power devices that transfer data over multiple points at long range rather than point-to-point short ranges. There are endless ways to interact with and implement your smart lock for both home and business. Next time the ‘AC repair guy’ says he’ll be stopping by anytime between 8 am and 3 pm, completely interrupting that big presentation that you have, just provide them with an ekey programmed to allow entry into your home in the time frame you set up! Then check your smart lock app on your smartphone to guarantee it was him who entered your home via access notification and recording functionality. Lock and unlock your front door at any time, from anywhere (communication channel permitting, of course). Integrating a smart lock into your business can be even more rewarding. Rather than giving employees physical keys that can be lost or easily replicated, installing a smart lock gives you the ability to know who is entering and exiting your business through the use of unique codes through the various key types. If you’re looking for a commercial locksmith, you can contact a locksmith in Las Vegas. A smart lock will also make your business more secure through this same access notification. If you get an alert after business hours that your doors have been opened, you can take immediate action rather than waiting to find out about a break-in when you come to work the next morning. Lugging in supplies to the office break room? No problem! Just approach the door, your smart lock and let your smartphone app handle the rest! The key to the security behind a smart lock is its ability to control who is entering and exiting the home or business you are protecting. Just being aware of what is going on, whether you are there or not, is the peace of mind that this smart security can provide. With the sheer number of smart locks to choose from and the different ways to connect them, and let’s not forget about that pesky deadbolt, having a pro come in to do the dirty work will ensure that your peace of mind begins right away. Find an ESA member company at www.Alarm.org to help you decide what you need for your home or business smart lock security and get ready to open every door you breeze through with the magic swipe of your finger. And buy some Smurf Berry Crunch while you’re at it!